I’m not sure how this is going to affect my credibility but I have a confession to make. I’ve wrangled with it for over a year now and kept it a secret beyond the confines of home. I hope you’re sat down for this… I like Downton Abbey. There, I said it – let the brickbats come hither. As I wound myself up in excited anticipation for the Christmas Day special, I was soothed by a serene week having my motoring whims tended to by an automotive personal valet. 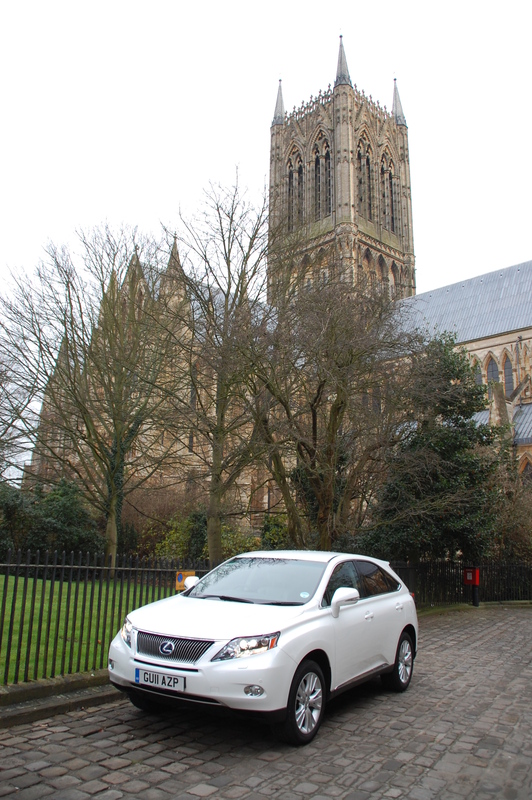 Lexus’ RX 450h proved to be a refined and welcome companion. Lexus has a reputation for comfort – how does the RX 450h compare? 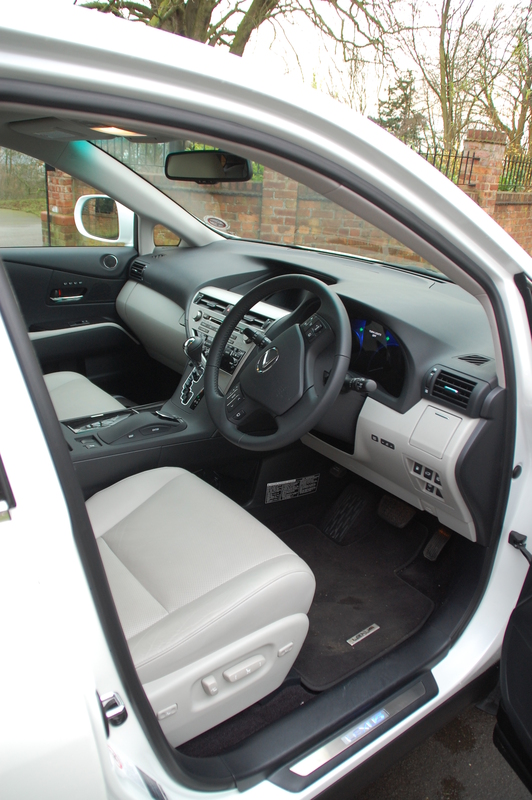 Climb aboard the RX – and it is a step up, both physically and in SUV technological terms – and install yourself in the enveloping luxury of the driver’s seat. Reach forward and push the blue starter button and your very own electronic Mr Bates comes to your assistance, easing the chair and steering wheel towards one another in unison, to the pilot’s pre-set position. 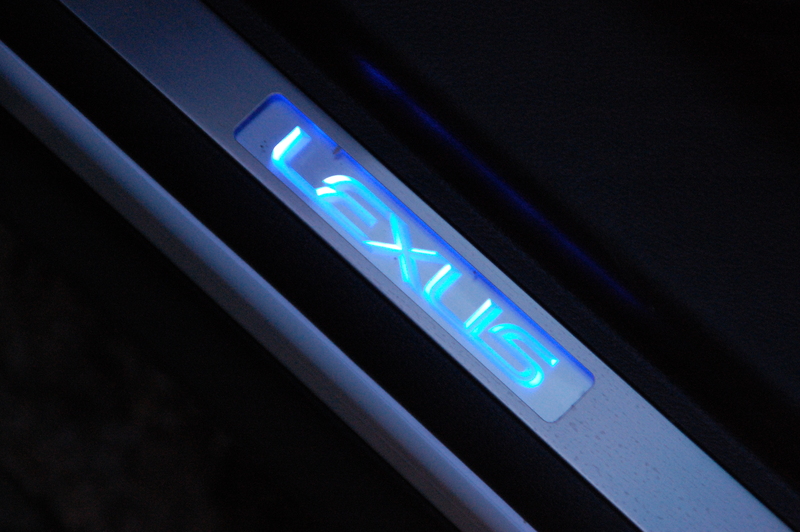 Depress the azure roundel to turn the Lexus off again and the reverse happens. Ingress and egress equilibrium is achieved. Both front seats are, naturally, adjustable at the touch of buttons in 10 directions, with a of trio memory settings on both sides; gluteus maximus muscles are treated to wafts of warmed or chilled air permeating through the perforations of the semi-aniline leather. Such is the level of convenience with the RX’s cabin that finding the head restraints had to be operated by hand (yes, manually), left me tinged with a momentary dose of sadness. However, the sheer comfort of the seats soon washes away the lament and you can relax in anticipation of your journey ahead. Your eyes are drawn to a unique looking dashboard, continuing the Japanese brand’s reputation for hewn from granite solidity. Rattle and squeak potential has been banished, your fingers satisfyingly touching and gripping a variety of high quality interior furnishings. Unlike with the LS tested recently, there’s just a brief smattering of ‘is it real or not?’ wood, finished with a dark grey lacquer, complementing the pale grey hued cabin. The overall effect is one of tasteful décor gracing a surprisingly bold interior. You’ll not mistake the RX’s dashboard for another car’s and at least Lexus has ditched the conservatism in the pursuit for the younger audience that the hybrid SUV will bring to the brand. Unfortunately, it lacks a coherence with its extreme curvature being at odds with the L-finesse exterior panel work. 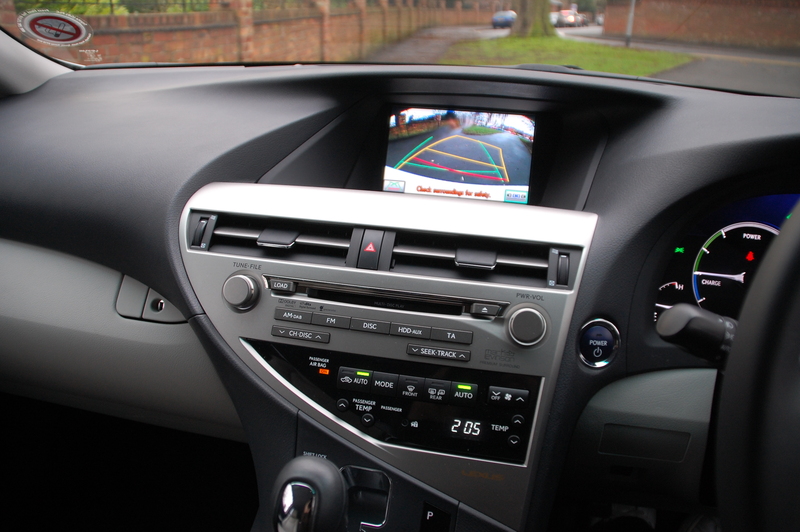 Ergonomics are inconsistent too – the remote touch mouse controller for the infotainment and satnav functions initially feels slow and alien but quickly becomes very easy to use, if a little long-winded to go through some of the menus. Other minor switchgear is less successful though – curiously the climate control’s temperature buttons protrude from the glossy plastic finish like afterthoughts and don’t marry immediately up with the rest of the heating and ventilation button bank. Like entering the VIP area of a nightclub or a tasteful reminder of your investment? These are but minor quibbles and like with any car you spend time with, it doesn’t take long to familiarise yourself with where everything is. And once you have, you’ll enjoy exploring all the RX has to prod and poke, with controls galore to operate everything from the 15 speaker Mark Levinson audio system to the electrically opening and closing tailgate. The tailgate function was a particular favourite. Something so simple you rapidly convince yourself it’s an absolute necessity in your life. Plus in car parks, as people glance over at the boot opening street theatre, alerted by the whirring and beeping, you can give them that smug ‘yes, I did just make that happen with a plip of my keyless fob’ look. You’ll feel less smug when you look inside though. It’s a spacious load bay at 446l with the seats up, extending to a generous 1760l of nearly flat space when they’re folded, but the loading lip and boot floor are high. Those batteries for the hybrid function have to live somewhere and in a car with a pre-requisite for high ground clearance for occasional soft-roading, under the boot floor is the logical location. The tonneau cover protecting your goods from prying eyes feels disappointingly cheap while the aggressive angle of the tailgate glass means this isn’t an SUV you buy for its outright practicality. If you’ve a propensity for transporting tall and boxy loads, best get yourself down the Land Rover showroom. 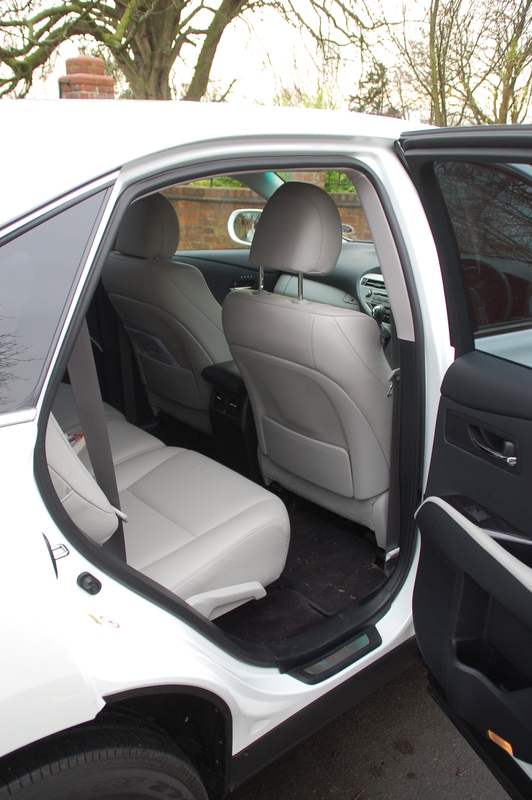 Residents in the back seat will travel majestically too, especially in the outer two berths, the backrests reclining and the bases moving fore and after to maximise legroom potential. The seats themselves are genuinely cosseting too, although adults in the centre of the bench might feel less special than their companions, with a narrow slot between the seatbelt buckles and reduced ‘give’ in the cushion. At least it’s wide back there so there’s no need for involuntary cosiness. 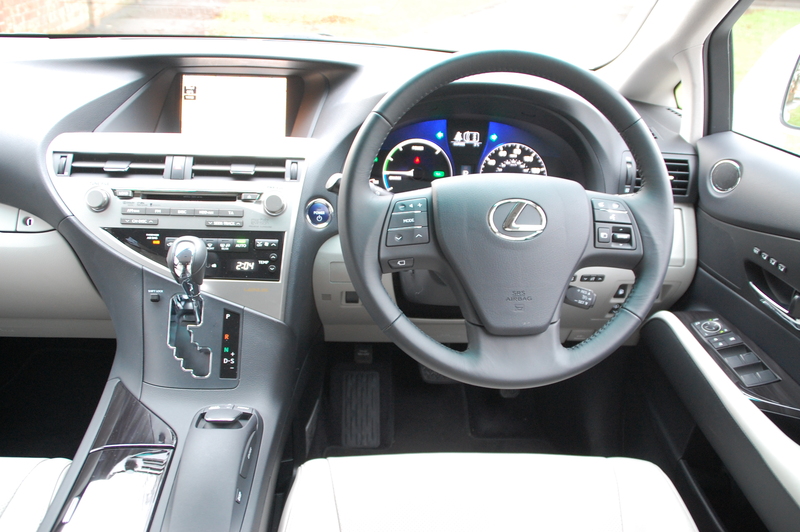 In high SE-L grade, the RX 450h has a long list of standard equipment including automatic LED lights and wipers, cruise control, Bluetooth audio and telephone connectivity, parking sensors, rear camera, illuminated front scuff plates and keyless entry. As impressive as this is, it’s disappointing that on a car costing a shade over £54,000 to discover that metallic and pearlescent paint is a £610 option. 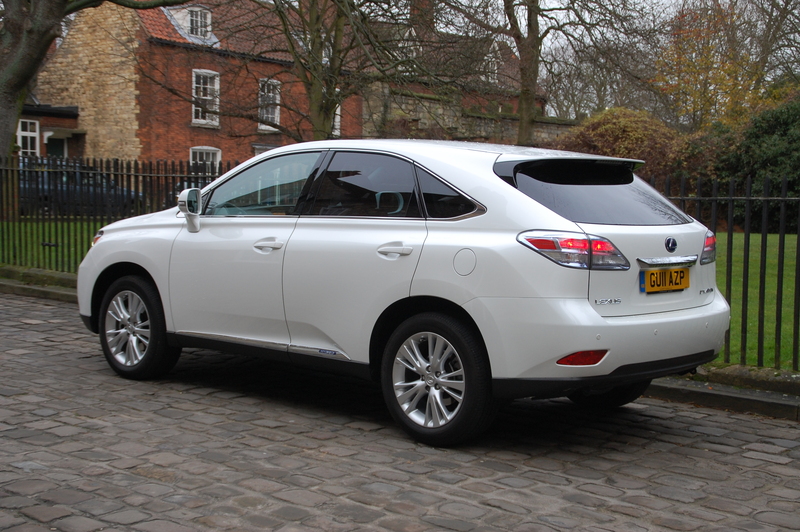 The Lexus RX 450h looks bolder than earlier models. Is it a brave new world? Unusually for a brand that doesn’t take too many risks styling-wise, this Lexus eschews safe and ploughs its own furrow. Its success depends upon your personal perspective, but for me it’s a grower rather than an instant winner. The bodyshell makes an attempt to bridge the gap between traditional SUV estate styling and the current niche-within-a-niche fad of a coupé-esque roofline and sits somewhere between the two. The rake of the rear roofline isn’t as severe as the D-pillar suggests, ensuring rear passengers don’t have to tilt their heads forward to ride in the back. Lexus’ L-finesse design language appears to consist of lots of grooved and creased details to break up the slab sided flanks and whilst the rear number plate surround hints at the spindle-shaped details at the extremities of the CT and latest GS ranges, the grille doesn’t follow suit. Instead, it wears a double curvature multi-vaned arrangement, that’s rather handsome. Either side sit enormous multi-lensed headlamps which, together with the nose’s height and width, combine to create an imposing visage to dominate the rear view mirrors of traffic you encounter. The RX 450h's front end is imposing and distinctive. But is it L-finesse? Talking of rear view mirrors, the RX’s gargantuan rearward looking glasses look ungainly, protruding from door-mounted stems, but are superb at assisting all-round visibility, the offside one dipping from its usual position when reverse is selected so you’ve more of an idea where the rear wheels are. 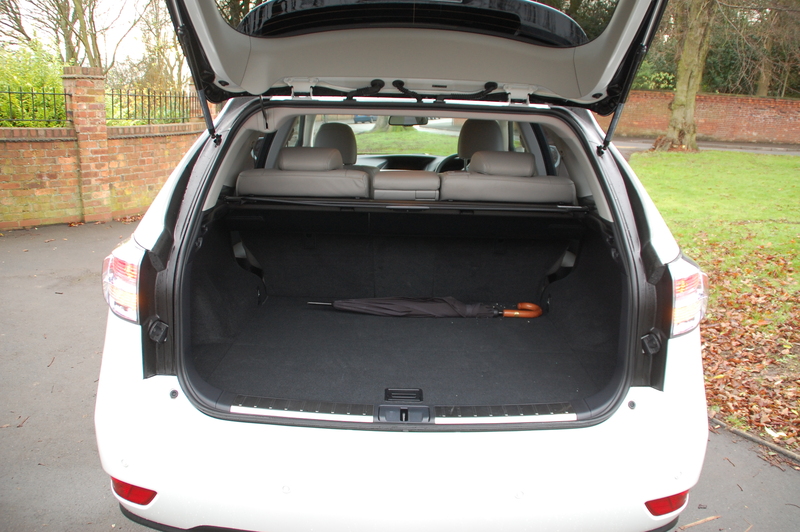 A useful fitment as the Lexus SUV is a wide car and fills car parking spaces with ease. It’s painless to manoeuvre about with all its aids and display screens but you’ll still hunt out a generous slot, otherwise you risk parking the car but find yourself unable to get out. Chrome detailing and that shimmery pearlescent white paint produce an effect that’s not for the shy and retiring. Sure, the RX 450h comes in more subdued shades but they don’t highlight the intricacies of the body anywhere near as well. And, there’s a certain rightness about the pale bodywork, teamed with the blue-tinged hybrid badgework that hints at cleanliness and purity. 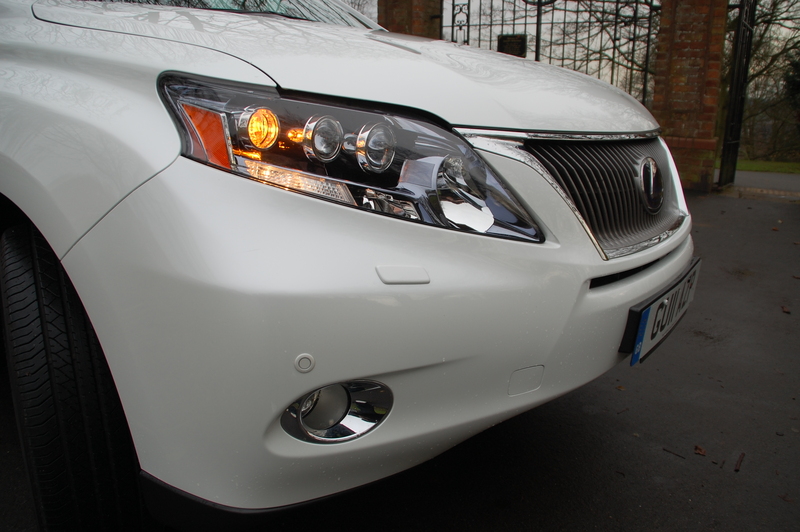 White’s becoming synonymous with Lexus and Toyota’s petrol-electric range, in a similar way that it is to Apple’s iProducts. While the RX treads a design path that separates it from the ever-more crowded luxury SUV market, it manages to look distinctive without creating a new chapter in the Big Book of Marmite Styling. Driving around you realise how many first and second generation RXs there are out there and alongside them, the latest version looks like a fittingly progressive evolution. Neither Lexuses nor SUVs are renowned for impressive on-road dynamics – is the RX 450h a self-fulfilling prophesy? This third generation RX has the benefit of double-wishbone rear suspension, improving both packaging and handling over the previous strut setup of the first models but don’t for a moment get lulled into thinking this is an SUV that handles like the proverbial sports car. It doesn’t. All things are relative however and whilst the RX’s height and over two tonne girth don’t lend themselves towards handling finesse, the fitment of sophisticated electronics and variable height air suspension do make the Lexus go around corners with a much greater degree of sophistication than you’d expect. The issue isn’t how it gets around bends, but rather the detached feeling you experience as you drive. There’s little effort to engage the driver in what’s going on through the wheels and pedals, relying on growing familiarity betwixt car and pilot to extract the most from the combination. When that connection is made, you soon appreciate that the ingredients are essentially all there, it just requires tuning to enliven the experience. Cornering is tidy, with precise turn in and a satisfying lack of body roll. The rear wheels get all-electric power sent to them when the RX senses the front wheels are losing traction – cornering with vigour induces the engagement of four wheel drive, as does harder acceleration. Such a train of thought is a dynamic cul-de-sac, because the Lexus is tuned for comfort and economy and in these categories it excels. Haring around bends is the complete antithesis of the RX 450h’s raison d’être. As a consummate mile-eater, the Lexus devours long distances with ease making it the perfect companion for traversing counties quickly. Its supple air suspension not only massages out imperfections in the road but minimises float, ensuring passengers don’t suffer Channel crossing-like choppiness. The system also works well in urban confines, providing a welcome softening to the harsh realities of High Street ruts. Whilst not as smooth and cushioning as Citroëns of yesteryear are famed for being, it’s more controlled and less bouncy than other 4x4s of this ilk. The comfort-oriented package encourages gentle driving, which subsequently has a positive effect on the RX’s thirst for unleaded. The electrical assist provided by the pair of motors enables the Lexus to be driven at lower speeds in pure EV mode, the engine only cutting in to power ancillaries such as the heating system. 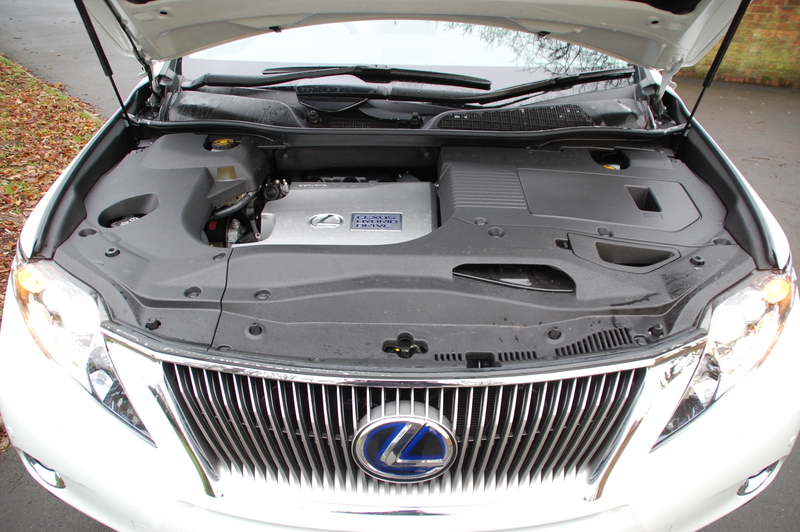 Lexus claims an impressive average on the combined cycle of 44.8mpg, which betters most diesels offered by rivals. Real world conditions never truly replicate the parameters of the test but a typical average during my week of 36mpg left mixed emotions – still impressive for a big SUV with a 3.5-litre petrol V6 but some way short of the official claim. Power delivery is smooth and progressive, feeling unrushed as the accelerator is treated softly, but there’s a wealth of power ready to be transmitted to the asphalt as the pedal is pressed towards the plush carpet. Accompanied by a deep six-cylinder rumble, 60mph can be reached in less than eight seconds. All RX 450hs are identical in their mechanical specification, mated only to an electronically-controlled continuously variable automatic transmission. Utterly refined, seamless and free from a tendency to wail through the rev range, the lower-dash mounted lever is best left in ‘D’, rather than flicking right to rock to and fro the six ‘ratios’ on offer. The current UK line-up consists of SE, SE-I, SE-L and SE-L Premier variants, together with a limited edition 450h Advance model. Compared to the model tested, the Premier tag buys you an even more comprehensive entertainment system, sunroof, head-up display and radar cruise control. Prices range from the SE at £44,530 rising to £61,055 for the SE-L Premier. Lexus’ pursuit of the hybrid niche is paying dividends in the premium SUV market. 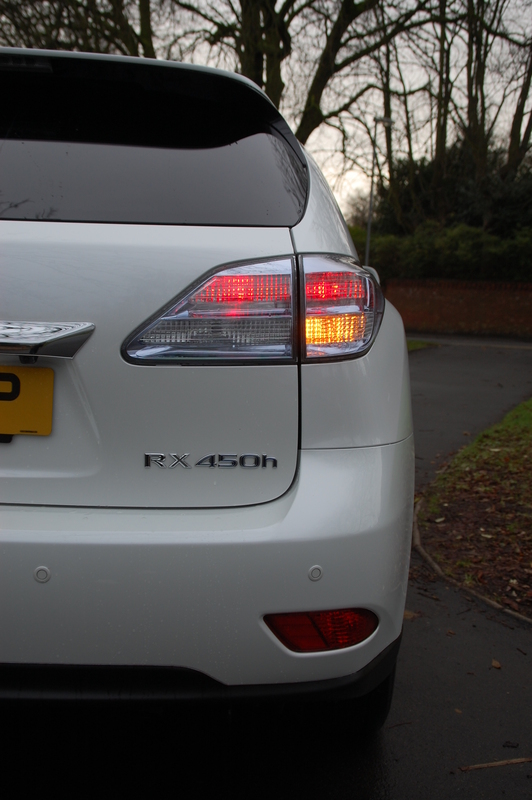 For a country in recession, judging by the number you see on the road, the RX 450h is proving to be a popular choice. 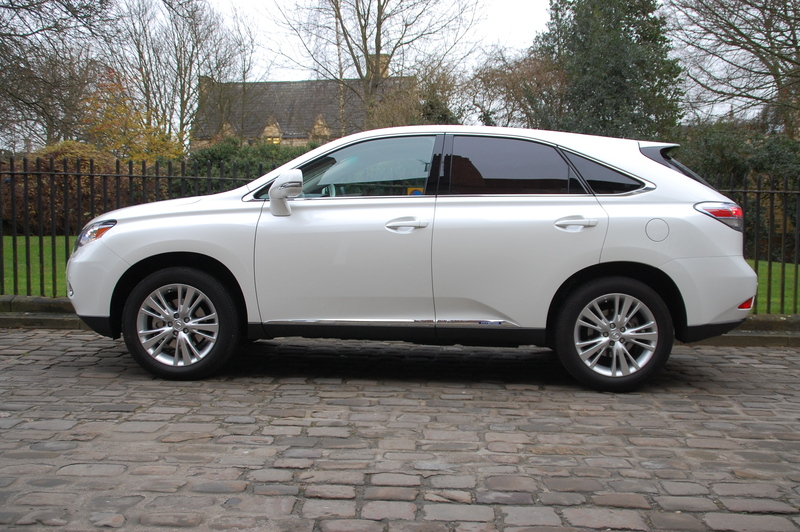 Some may select the RX 450h on looks alone whilst others may be drawn in by Lexus’ enviable reputation for quality and reliability. It doesn’t appeal to the crowd who might plump for a Cayenne or Range Rover Sport, nor does it attempt to rival the bigger 7-seater offerings like the Discovery 4 or Shogun. 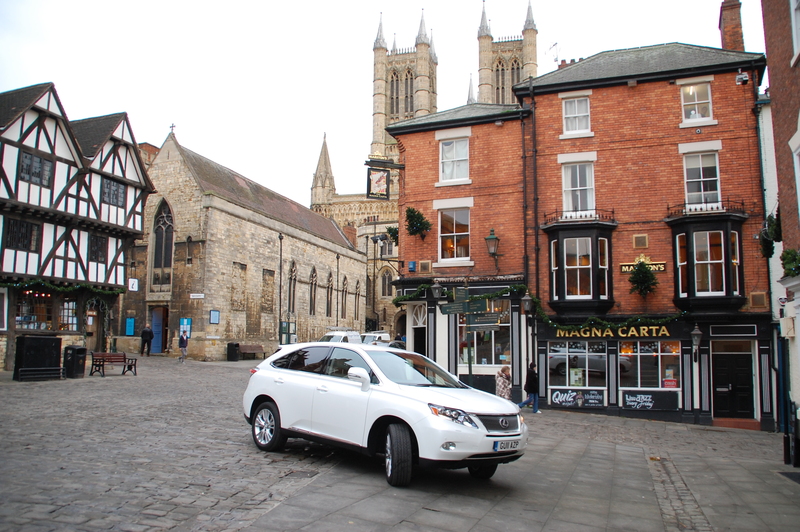 What the Lexus RX 450h does offer something different for those who crave the commanding driving position of a 4×4 but want to drive with a clearer conscious, pumping out fewer emissions and consuming less unleaded as they remain resolutely on-road. That hybrid power train is currently as close as you can get to having your SUV cake and eating it guilt free. 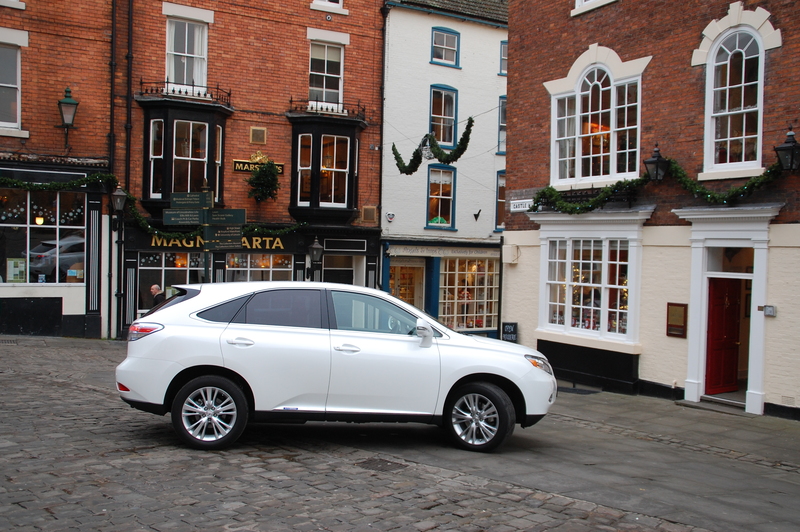 Would a 21st Century Lord Grantham have an RX 450h on order? And the money saved at each fill up could be the difference between keeping Mr Bates in your employ or not. While I find the illuminated door sill a little confusing on this car – a bit Fast and Furious for my liking, as it is on the IS range, I quite like it, the car that is. If I was in the market, I think the RX would be on my list. Although I don’t quite know what market / circumstances that would be. I think you’re spot on about the hybrid niche and wonder if Lexus will put themselves in the same position Volvo has with safety. Just hope the avoid the smugness of the parent company’s Prius.